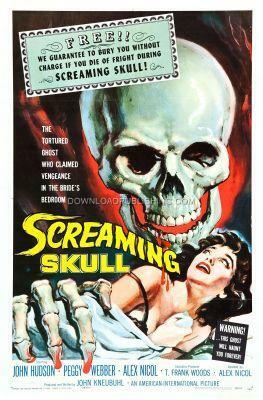 "The Screaming Skull is a Motion Picture that reaches its climax in shooking horror. Its impact is so terrifying that it might have an unforseen effect. It may kill you! There fore, its producers feel they must assure free burial services for anyone who dies of fright, while seeing THE SCREAMING SKULL!" Eric Whitlock (John Hudson), a rich widower, arrives with his new wife Jenni (Peggy Webber), to his empty home that he once shared with his first wife. The house is a beautiful mansion and the grounds are maintained by the Gardener, a simple man, that loved the first wife and has maintaned the garden as if she was still around. Jenni, having a history of mental illness, starts seeing strange things. Is it her imagination or is the first wife haunting the mansion.